A month old and trying to look serious already! At two months. Naughty and adorable! two weeks short of six months and his teething almost done. One ear flops down at times!! We were married for little over a year, much in love and happy but we felt we needed a puppy to complete the picture. 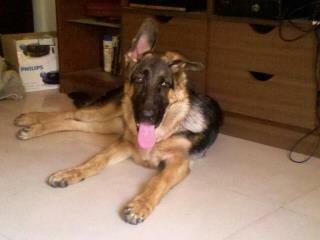 So we got Luka on 11th December 2011. He was only 25 days old when the breeder sold it to us. We had no clue that puppies this young aren't supposed to be separated from their mommy. It was only when we got back home after a 600 kms drive that we realised he was too small to drink milk from a bowl. He could barely stand and walk! So I bottle fed him for a month. Once every 2 hours, like his mommy would. He would make mewling sounds and pumps my hands with his paws, as if hes milking his mommy, poor baby. After that, he was on Royal Canin and continues to this day. Eva, Thanks so much for sharing your lovely Luka with us. I can't believe anyone would sell a puppy of any breed that early - that is totally irresponsible. But good for you for doing what you had to do to help Luka grow and mature - please make sure to keep him up on his shots and if at all possible, to socialize him all you can with other dogs since he was taken from his family at such an early age and he missed out on a lot of opportunities to learn from his momma and littermates too on what it is to be a dog. Continued success with him - he looks like quite a little character! In time he will pay you back for all the time you put into him when he was so small and couldn't help himself. Maybe give him a belly rub for me too! Luka sends you licks and a woof!! Thank you everyone, for the lovely things you said and the wonderful advices. Luka is now 8 months old, healthy , handsome and quite a handful. He is a quick learner, is alert and affectionate. He does have a bit of aggression towards other dogs and I guess this is because he did not have the opportunity to learn dog social skills in the litter. Not his fault at all nor does he have bad genes. Other than that, he does not display any other form of aggression at all like food or territorial aggression. Look at that adorable little face, what a Beautiful little puppy. Enjoy this puppy time take all that you can, it is so precious, bonding, teaching and training. He should have been with his momma and his siblings for 6 weeks but you did an excellent job in taking care of him at the early 25 days old. I would think you have even more of a bond since you bottle fed him. His ears will go and down as he is teething and then one day, boom they are both up and straight, just be careful he doesn't scratch too hard, you don't want the carthage to break, then ear won't go up. 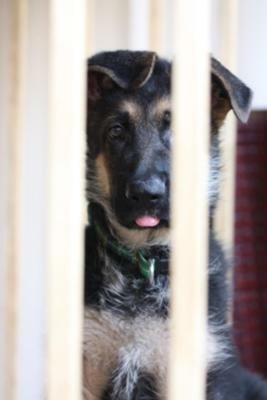 Luka is a handsome little guy now but he will be big, strong and will be your Protector. 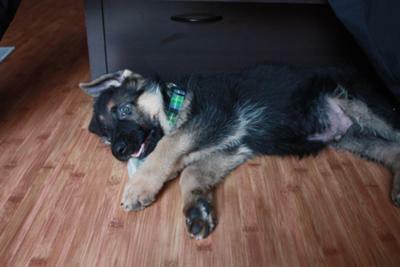 Read our story GSD puppy Mia's story and Mia My Beautiful German Shepherd Dog. Take care of Luka and he will take care of you! Hi! Eva, Thank you for sharing your beautiful story of Luka. You are taking such wonderful care of him. The photos are so very precious I know you will give Luka, a very good life! Hugs to you, & Luka!